If I can do it… everyone can. It’s not an easy task though, I actually put it off for many years… but eventually I recognised my programmes, patterns and beliefs I was repeating whilst playing the roles of Victim and Aggressor in the Human Game. My new awareness allowed me to consciously observe myself; my ideas, words, thoughts and actions and understand the wisdom of the Game and be able to experience the magic and miracles IAM underneath all my conditioning. Yes… YOU are that powerful too AND the only thing in your way is yourself… or rather your fear, belief in lack and the power game of the aggressor or the attention the victim seeks. 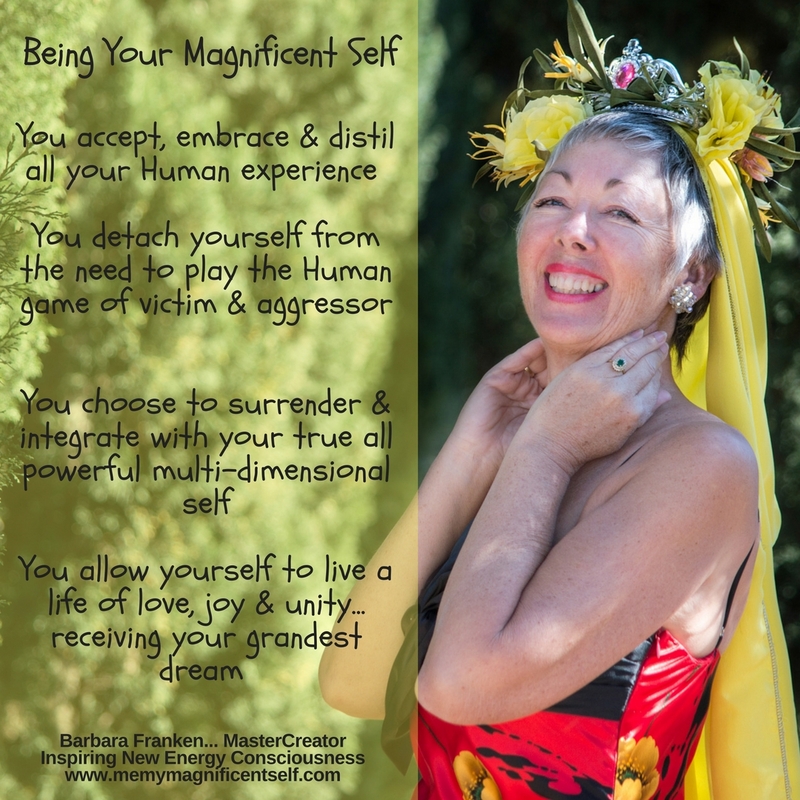 So how do you step out of the Human Game and put an end to your programmes, patterns and beliefs that are deeply engrained in your body and mind without repeating them for eternity AND allow yourself to Be Your Magnificent Self? Observe and be aware of all your ideas, thoughts, words and actions in each moment. Be aware, without judgement of when you feel… not good… sad… angry… hateful… etc and observe the situation that brings these feelings on. Embrace your feelings, maybe you can feel its location in your body/mind. You can ask the feeling to express itself. Listen with all your senses. Know you will at some point, maybe another day, understand the wisdom behind this feeling and how your behaviour as a victim or aggressor has brought this on. Allow yourself to accept your part in the situation and how you feel AND forgive yourself. Allow yourself to understand that The Human Game of Duality is to help you realise your own loving presence and infinite power… a part of source itself… hidden underneath all your conditioned fear, lack and victimhood. Remain ever vigilant of slipping back into playing the game. 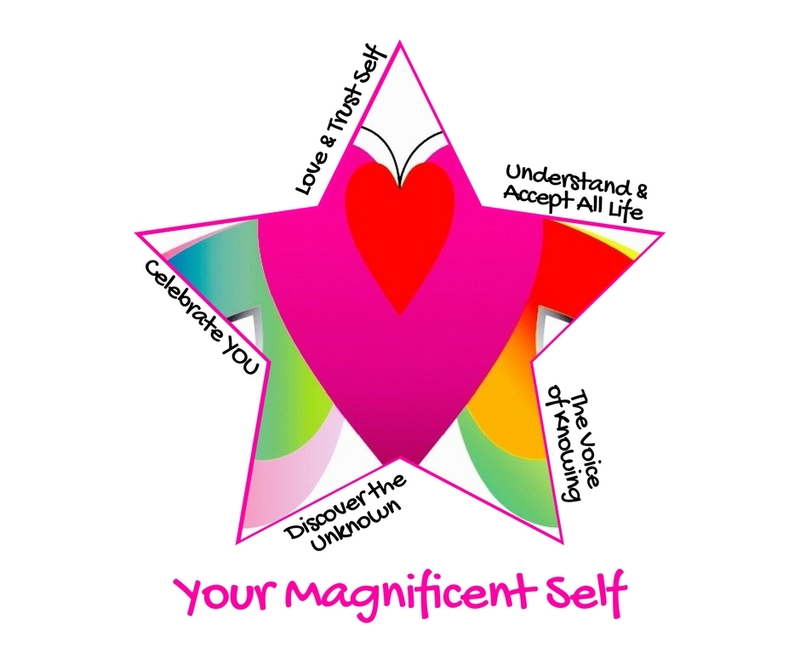 Embrace and love yourself unconditionally and have the intention to detach yourself from the need to play in the game to gain false power, importance and recognition and instead intend to live a life of celebration as Your Magnificent Self. Choose to surrender your Human body/mind to your Divine spirit that waits to integrate as one Body Consciousness (Body, Mind & Spirit) and take you beyond on a new adventure playing a new role as Your Loving, All Powerful & Magnificent Self experiencing a life of love, joy and unity. It takes a lot of conscious awareness and allowing; to love and care for yourself so much, to observe yourself playing in the game… and dare look at and embrace the moments that don’t make you feel good. For me, these past few months, I have embraced my anger that seemed to have resurfaced to unveil a deep well of sadness. I was missing my dependency and recognition from certain people and being in control and caring for others. I knew that if I was to get through my integration without too much more discomfort and continue to shine as My Magnificent Self, I had to detach myself from these old roles and trust my Divine Self to show me how to settle deeper into my new role as Master & Creator and remain the compassionate presence with myself, my family and friends. Moving on from playing my Human roles, I can focus more on my DivineHuman role… creating awareness for the Evolution of Consciousness and bring to the hearts that are opening, the message of how Divinity is embodying the Human and fulfilling its grandest dream to know self, to express self, come back to self and evolve self into a consciousness and reality unknown to Self… up until this moment. It’s a wonderful time for everyone to awaken from a long Human experience and consciously experience this great shift of consciousness and transformation of the Human to the DivineHuman. We are all unique and experiencing life from different perspectives, so it’s going to take as long as each person needs to complete their natural integration or fusion of the light body/mind and the physical body/mind. So please listen carefully to the natural intelligence of your body who knows what YOU need in each moment. Love it unconditionally as it navigates YOU through this process. Don’t under estimate this process, your whole biology is changing from carbon based to a crystalline one. Your Body/Mind will need extra rest, plenty of fresh water, good food, fun and loving people around you… as everything you have hidden away from your Human experience… hurt and broken pieces of yourself, as well as dark secrets is being churned up to resurface. For YOU to acknowledge and embrace before it can be transmuted into new potential to serve you in a new and powerful way. Remember if you hang around playing the Human Game in any form, (even doubting or judging yourself and others) this will create energy blocks in your body that have to be cleared in a way that might be uncomfortable. Trust me, I know. By all means go to the doctor, but when they don’t know what’s happening or can cure it… start looking at the games you continue to play, stop them and give yourself more quiet me-time to discover all about yourself… and become your own best friend, doctor and spirit guide. Recently I asked myself if there was anything to help with my hot and dry flaky skin which the extreme hot weather in Spain continues to drive me nuts. I was quickly guided to discover the 12 tissue salts used in homeopathy which I thought I’d share with you too. Be good to yourselves and know that YOU are quite perfectly transforming. I have written my Awakening Story, discovering who IAM and what life is all about and sharing my vision of Heaven on Earth… to help inspire hearts to open and realise their own truth. ‘A most magical journey exploring Who IAM with nine Elemental Beings I perceive along the way and help me discover and integrate all of myself. My Body, Mind, Spirit/ALL LOVING self and aspects that allows me to step out of a dual world of fear, struggle and limitation and into a world of unity, love, grace and freedom’. I have also created, together with sacred friends… a MasterCreator Class… A sacred, quiet and safe space to allow YOU to explore, discover and express All of yourself; Body, Mind, Spirit… and prepare yourself for your new role as MasterCreator. All the money raised from my books and classes goes to my non-profit Business The Magnificent Consciousness to help inspire others through creative expression to explore, discover and express the magnificent Consciousness each person truly is and their unique and essential part in the heart of life.